Counting Pumpkins on a Vine will help teach preschool children to count objects using one-to-one correspondence. 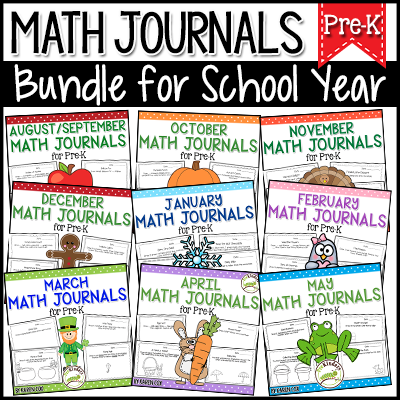 This uses simple materials and is very easy prep! Preschool children often need lots of practice counting with one-to-one correspondence. Even those children who can count numbers in order verbally, sometimes need help with the skill of counting objects. They need to learn they are counting “things”, not just reciting numbers, and that numbers represent a quantity of items. 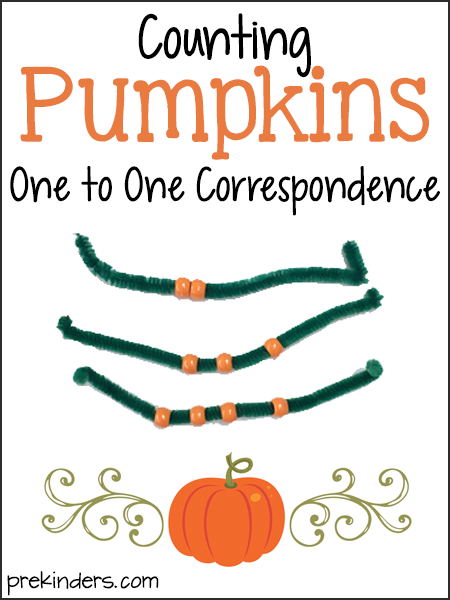 Make these “Pumpkins on a Vine” with green pipe cleaners and orange pony beads. Cut the long pipe cleaners in half. String orange beads on the pipe cleaners and bend the ends up so the beads won’t fall off. I made sets of vines for six children because I have 5-6 children in my small groups. Each set has vines with 1-6 beads. One vine has one bead, the next vine has 2 beads, and so on. I keep these sets in a ziplock bag and hand one bag to each child. The kids pull any vine out of their bag, count the pumpkins, and tell me their answer. The best way I’ve found to teach kids to count with one-to-one correspondence is by moving the objects over as they count them. This way, they will touch each object as they count, rather than counting out more numbers than objects. If they’re taught to move objects, they will in time learn to count correctly. As children count, they move pumpkins to the right side of the vine, saying one number as they move each bead. Demonstrate this to the children a few times before giving them their own bag. If a child still struggles, show them again how to move each pumpkin as they say each number. I made six bags with vines 1-6, but some children may need to practice counting pumpkins with 1-3, or 1-4, so I would only give them those vines. 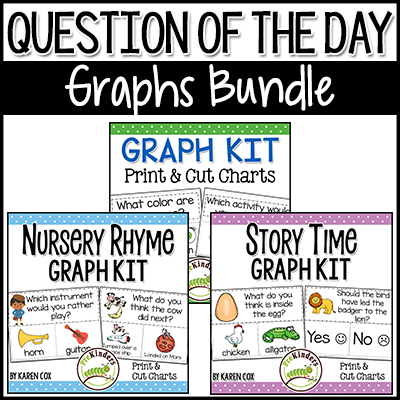 Other children may need to practice higher numbers, so I also have some vines with higher amounts on them. Just in case any beads fall off the vines, I keep extra beads handy to replace them. Each set of 1-6 vines is kept in a ziplock bag as pictured below. The extra numbers are kept in bags labeled with the number because only some children need them. The number 7 bag has vines with 7 beads, bag 8 has vines with 8 beads, and so on. I store all the counting pumpkins bags along with the extra pony beads in a gallon size ziplock and store them in a box with my other October materials. Then they’re ready to go next year! 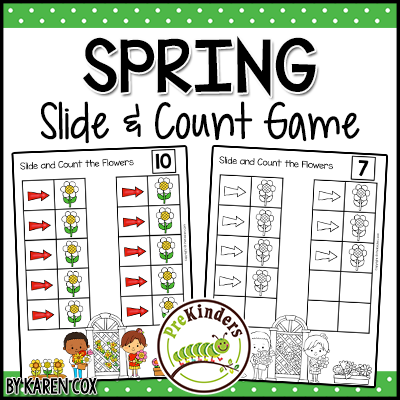 Your students might also benefit from these Slide and Count games that help children move objects as they count so they can correctly learn one to one correspondence. I sometimes have to demonstrate this concept to parents because if I tell them their child can count objects to 4, they often say “but my child can count to 15!” What they mean is their child can count verbally to 15. However, the child cannot count 15 objects correctly. They say the numbers in order, but when counting they will say the numbers faster than they touch the objects. For example, when counting 4 objects, they will count more numbers than objects they touch, and end up saying “7”. Sometimes the opposite is true, and a child touches the objects faster than they say the numbers, and end up saying it’s a smaller amount. 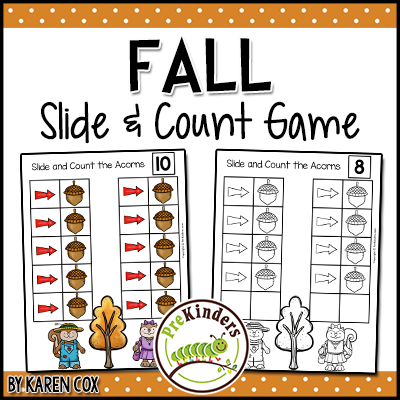 I hope this counting pumpkins activity helps your prekinders learn good counting skills! Find more activities for learning with pumpkins here. I have been inspired by your dedication to the teaching profession. Your ideas go much further than pre-kinder. Your enthusiasm and positive outlook applies to us all – whether we are teachers professionally or not. We are all human. We stand to benefit from your cheerfulness and deep caring for what you do for others more than in the classroom. Simple to prepare and a great way to teach preschoolers to count! Thank you! Awesome ideas as always. Thank you. This idea came just when I needed an idea to help one of my MDS students understand 1:1 correspondence. I had seen something similar before, but completely forgot about it 🙁 Thank you for reminding me and doing it in such a cute way. Thanks, Sarah! I’m so glad it will help! You have such wonderful ideas and you’ve been a big help in my 4/5-k class. Thank you! Thanks, Katie! I’m glad to hear it! Thanks Donna! I’ve also seen the bigger pipe cleaners at the craft store which might help with the bigger beads.